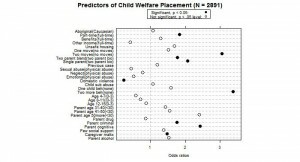 Okay, here we go, my long overdue post on data visualization in social work research. You can find study details and data here on the Dataverse network. 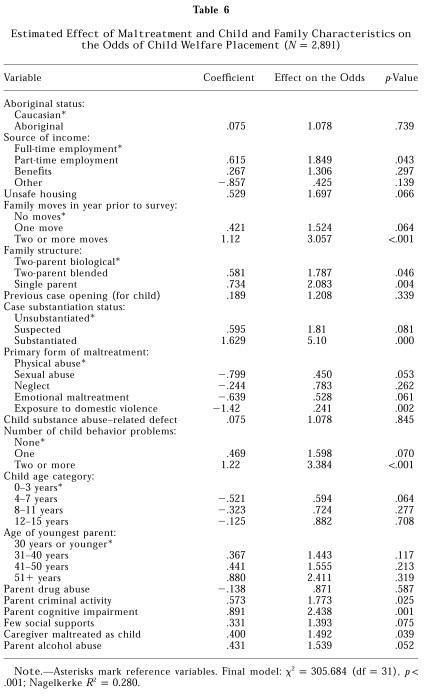 First, let’s examine a published logistic regression table published in Trocme, N., Knoke, D., & Blackstock, C. (2004). 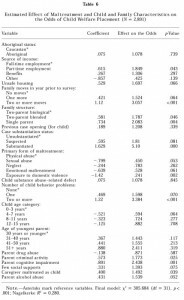 Pathways to the overrepresentation of Aboriginal children in Canada’s child welfare system. Social Service Review, 78(4), 577–600. 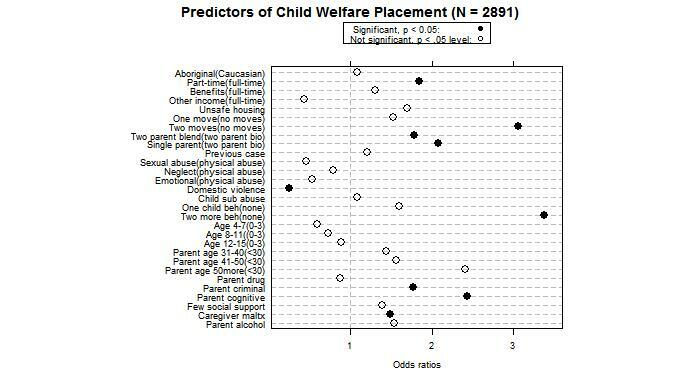 I’ve replicated Trocmé et al’s results to produce a dotplot in R based on the work of William Jacoby. This visual representation of the data appears to have several advantages. 1. The results are shown in visual form rather than forcing the reader to interpret numbers. 2. It is easier to distinguish statistically significant variables from those that are not statistically significant based on solid black v. empty dots. 3. The strength of the relationship between each IV and DV is more intuitive based on the distance from baseline of OR =1. In a recent brownbag discussion, Toni suggested making the size of dot correspond to the size of the Wald statistic (a form of effect size). The graph is missing information that helps the viewer appraise the amount of uncertainty, e.g., standard errors. I’ll show an example of how to report the standard errors in the next post on this subject. For now, I am curious if you can think of additional advantages / disadvantages to the dotplot in comparison to the standard regression table. Published by David Rothwell on August 15, 2013 at 8:10 am under Uncategorized. 0 comments.